Be the first to know when the Xbox 2/Project Scorpio Pre Order is available by filling out the form on the right. Don't be late like some were with the Xbox One. With certain retailers putting a stop to pre-orders fairly soon after the consoles were announced, it’s not surprising that sales of Xbox One and PS4 were high. Despite the early setbacks which were criticized by many (and not to mention changed – which was also criticized. I guess you just can’t win…) Xbox One still went on to push retailers to the limits during the lead up to the consoles release. Announcing a console so early means that it is inevitable that the hungry consumer will not be able to wait for their shiny new machine. Getting your name down early is as much of a guarantee as you can manage to make sure you’re one of the first people to get it on launch day. Of course, those ordering on line for a home delivery always run the risk of something going wrong at some point down the line. The mail van may burn down or get a flat tire, being just two (albeit unlikely) scenarios. However, this form of pre-ordering is favored amongst gamers. You may not get your console at midnight with the tent-dwellers who camped outside the store during the last few days leading up to release, but you at least know that you can stay within the comfort of your home and get your brand new console at some point during that day. Xbox Two will, undoubtedly, spark a similar flurry of pre-ordering activity. Microsoft has said that Project Scorpio, the new console, will be out in holiday 2017, but we don't know which month yet. In fact, pre-ordering the console and having it delivered may very well be the last time you ever receive a piece of physical equipment in relation to your Xbox Two, currently code-named Project Scorpio. If the console features only downloadable software, then gamers will have no reason to leave their homes again. Gaming specialist retailers may have even become a rarity once the Xbox Two is announced, so those wanting to queue outside a store will have to make do with pitching their tent outside their local Walmart. But other than being able to say ‘I was there’ or ‘I’ve had my console since day 1’, what incentives are there to pre-order Project Scorpio, also known as the Xbox Two? Like the Xbox One, we can expect there to be a ‘Day 1 package’ released on launch, featuring a unique design element and an achievement. Microsoft have fully embraced the achievement system with Xbox 360 and Xbox One, and it is likely to continue well in to the next generation. I may not be a devout achievement hunter like some, but I was heavily swayed towards pre-ordering the Xbox One Day 1 edition due to the exclusive achievement. And to this day, I still look at it fondly. Another incentive that many overlook when pre-ordering, is that a number of big retailers have a pricing strategy in which if you pre-order the console and a price is stated, even if that price is raised at a later date you will still only pay what you pre-ordered it at. It’s because of this policy I was able to get Fifa 14 for ‘free’ with the Xbox One because the package changed on Amazon. This is always an advisable avenue I would take, because there is always the option of canceling your pre-order at a later date should you change your mind or find a better deal elsewhere. Are there any negatives to pre-ordering Project Scorpio/Xbox Two? At surface level it doesn't seem so, but let's dig a little deeper, shall we? The idea of pre-ordering something seems like a no-brainer. You get to make a down payment, you're guaranteed the console, and you get some sweet stuff to boot. That last part, the "sweet stuff" has become a major point of contrition among the gaming crowd. I mean, there's nothing wrong with pre-ordering, but what if you can't scrape up the cash by launch? Should you miss out on that free achievement, skin, or limited edition? It's almost as if everyone but the day one adopters are punished for not having the means to purchase it day one. This has bled over into games too, where entire characters, levels, or stories are left out for the sole purpose of dangling it like a carrot in front of gamers to convince them that pre-ordering is the way to go. It's a little underhanded, and I can sympathize with those who have been scorned in the past. What's worse is this "free" content is then released as a paid download for people who didn't it pick it up on day one. Again, it's using a reward/punishment system to get people in on the ground floor. Isn't there a better way to convince people that a game, or in this case a console, is worth buying? I would say so, even as someone who loves me some pre-order incentives. An idea that comes to mind is something I mentioned when considering what would happen if the Xbox Two costs $1,000. What if the console did indeed cost that much? Who would pre-order it except those who could pay it off like a credit card? The incentive comes in two forms in my "Year One" plan that Microsoft has yet to steal from me (you can if you'd like). For one, the Xbox Two (Project Scorpio) "Year One" edition posted by me would cost $1,000 and it would include all launch accessories and access to the first year of first party releases to Microsoft when they release. So bam, you've got value right there. It would also require a contract with Microsoft where you agree to pay a certain amount each month until it's paid off. It's brilliant, I know, but it would make the pre-order worth it, and no one would be locked out on the basis of finances because it would be a simple down payment to walk away with the console that day. Of course, the price is always going to be a deciding factor, and Microsoft will have to be careful that they don’t price out their audience. 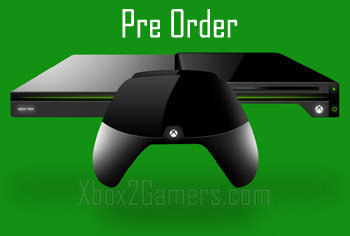 It could go either way, but for me, I predict that the Xbox Two will shock us all and will be reasonably priced. Don’t quote me on that. We shall see. So, once you see those words appear on Amazon or Gamestop ‘Pre-order your Xbox Two (Project Scorpio) console now’ what will you do? Scoff? Click it eagerly? Bookmark the page and keep checking back nervously? I can see that day being a lot closer than we all think. Would you pay $1000 for an Xbox 2? Interested in knowing when the release date and when I may be able to pre-order.